This is a sad post to have to make, however one of my inspirations musically is no longer with us. 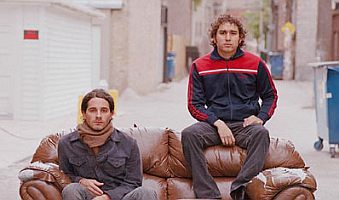 I found out this morning scanning the web before I came in to work about the untimely passing of Charlie Cooper, one half of the duo that made up Telefon Tel Aviv. I am not certain how many of you are familiar with their music, however it has had a profound impact on me both as a listener and as an aspiring musician. The sounds and moods created by these two on their albums explores a wide range of emotions, and explains why their music has been a mainstay in my rotation over the past few years. Especially throughout 2008, I left Fahrenheit Fair Enough in it’s own playlist in the iPod in my car, and would listen to it at the end of most afternoons as the evening set in. As many of you know I feel as though I am going through a time of trial in my own life, hearing this shocking news was an unfortunate way to put all my issues into perspective. Charlie was my older brother’s age, only four years older than I am. A lot of the people in my own social circle are somewhere between my age and his. I need to be more appreciative and more constructive with the time I have been given. I was fortunate enough to have the opportunity to experience these two musical geniuses live, as a part of the Re:Generation festival hosted by STS9 at Deerfields in July of 2007, and without a doubt it was definitely the highlight of the weekend for me, and anybody who has spoken to me about that trip can attest to this. Much appreciation for the work these two have done, as I stated it has had an effect on me both personally and stylistically in my own musical explorations. I know these Charlie has touched a lot of people both personally and through his music, and I hope everybody involved in making Telefon Tel Aviv knows how appreciative we are for what these two accomplished together. Thanks guys. It breaks my heart to inform you all that Charlie Cooper, my better half in Telefon Tel Aviv, passed away on January 22nd. We have been friends since high school, and began making records together a decade ago. We have been so fortunate to tour the world together, while at the same time having a massive amount of laughs at one another’s expense. Aside from Charlie’s singular genius and musical gifts, I can tell you that he was a total sweetheart of a guy, and a loving friend and confidant to people everywhere. His musicianship was surpassed only by his greater gift to the world – his warmth, his generosity, his unquenchable humor, and his undying loyalty to those whom he loved. In the spirit of honorable mention, however, I should mention that he had a shoe collection that was marvelous, knowledge of hip-hop that was profound, and knowledge of wine that was subtle. He is survived by a sister, a niece, a nephew, his mother, his stepfather, me, and more adoring friends than the Universe has dark matter. As such, his family and I ask for your discretion and consideration of our privacy during these extremely turbulent waters.